Transport and store your goods and items with ease by using a one, three, four or six slide lug rack. Increase efficiency and save time by using a lug rack outfitted with casters. 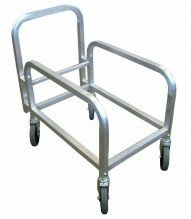 These aluminum lug racks are ideal for bakeries, commercial kitchens, butcheries, grocery stores and more! These lug racks are perfect for storing and transporting food, dishware, and a variety of other products.